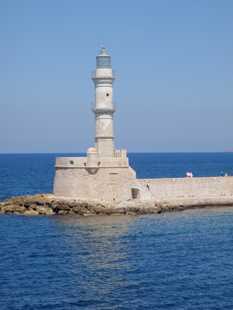 We reluctantly left Methoni to begin the 140 mile passage to Crete. First port of call there, Khania on the North West coast. The forecast was for light winds to begin with and so we were pleasantly surprised to be sailing shortly after leaving. The winds were very flukey though as we sailed between the islands, changing direction frequently, before eventually dying away altogether. We motored for a few hours, and then as is usually the case, the stronger winds we had been forecast began to build just as we settled down to dinner. Having eaten, we then set the sails for a blow,which duly came. It was a rather bumpy night beating into winds of 20-25knots, but under a reefed main and half-furled yankee she was not too uncomfortable and we both managed to get some sleep when off watch. The real excitement of the trip was some that we could well have done without. There was a lot of shipping around, and two vessels came uncomfortably near to us despite our having changed course to avoid them. In one instance we had to hang a sharp right and motor at full speed to get out of the way. Our AIS equipment identifies the vessel and we had attempted to radio them to make them aware of our presence, but to no avail. We have begun to think we must be invisible, in spite of our SeaMe! As we neared the coast of Crete, the shipping disappeared and we were able to relax again. Checking on our approach to Khania in the pilot book, we found that it is a difficult harbour to enter in strong onshore winds,which of course is what we had. Deep joy. In the event it wasn't too bad, and we arrived just after lunch time after quite a fast passage. We were pleased to find lazy lines on the harbour wall and so were soon moored up bows-to on the quay. Khania could not be more different from Methoni if it tried. Very definitely a tourist town, but not without some charm in its cobbled alleyway streets. 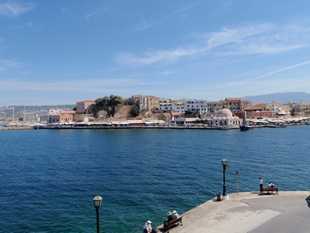 It has quite a large harbour, all surrounded by tavernas. 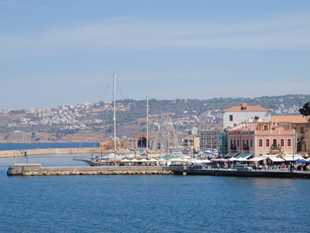 However, you can leave all the tourist bustle behind by turning left instead of right from the town quay, and instead you find a quiet, relaxed atmosphere with tavernas full of Greeks. We may dine in one of these tonight!